Previews for Allegiance, the new Broadway musical inspired by George Takei's true-life experience in an internment camp, begin tonight at The Longacre Theatre. Starring George Takei, Lea Salonga and Telly Leung, Allegiance follows one family's extraordinary journey through wrongful imprisonment during World War II. Uncle George and Co. have been chronicling the long journey to open Allegiance on Broadway in the documentary webseries Trek to Broadway. In Episode 5: Moving Too Fast, as the first preview draws near, we get some behind-the-scenes rehearsal footage and interviews with the cast, including our pal Greg Watanabe, who talks about his deep personal connection with the show. 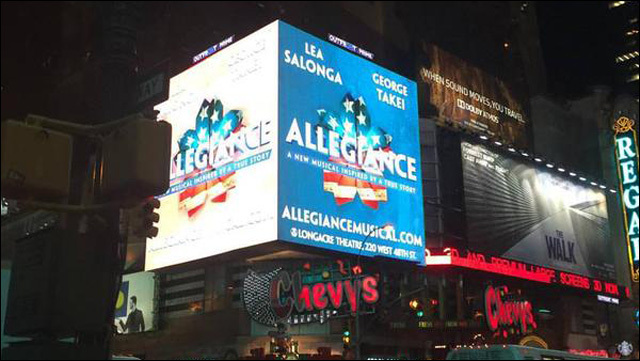 If you're in New York City, make plans to see the Broadway debut of Allegiance. Ticket are available now. For further information, visit the show's website and follow updates on Facebook.